Susan Stalewski’s major focus is undergraduate education in disciplines related to Biomedical Science, including clinical chemistry, hematology, urinalysis and medical diagnostics. An additional area of expertise includes the study of complementary and alternative medicine. Stalewski has undertaken a number of initiatives to improve student engagement and learning. Instructional technology expertise includes “clickers”, Second-Life, Podcasting and integration of rich media. Stalewski is a certified instructor in Online and Hybrid teaching (awarded 2010) and delivers several fully online courses each year. 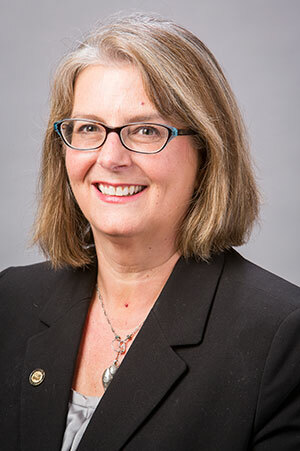 She is an active member of the University of Wisconsin-Milwaukee (UWM) Assessment Council, General Education Reform and the UWM Digital Futures project. She is a member of the steering committee for Renewing Our Commitment to Undergraduate Education for the Higher Learning Commission. Professional activities include the American Society for Clinical Laboratory Science (ASCL)– Board of Directors (2001-2011), serving as president of the Chapter in 2009-10. She has been a member of the West Allis-West Milwaukee Board of Education since 2004, and is currently serving as the president. Stalewski, S. M. (February 2019). Canvas Tools for Student Time Management. Active Teaching Lab -, Milwaukee. Stalewski, S. M. (January 2018). Making Large Small — A First Year Experience Course. UWM Symposium on Teaching and Learning, Milwaukee, WI. Stalewski, S. M. (September 2017). Student Evaluations of Teaching in the College of Health Sciences. Online Program Council, Milwaukee, WI. Stalewski, S. M. (July 2017). Avoiding Accidental Leadership. Annual Meeting, San Diego, CA. Stalewski, S. M., Obrien, C., Kate, G., Abigail, N., Shevaun, W., & Kristin, W. (January 2017). Deepening Student Learning through Faculty and Librarian Collaborations. UWM Symposium on Teaching and Learning, Milwaukee, WI. Stalewski, S. M., Kostka, K., Richardson, J., Kite, L., Mihlbauer, L., & Pedrick, L. (October 2016). UW Flexible Option: Lessons Learned in Developing Competency-Based Programs. CBexchange, Phoenix, AZ. Stalewski, S. M. (February 2016). How to Write Letters of Recommendation Without Losing Your Mind. Clinical Laboratory Educators Conference (CLEC), Minneapolis, MN. Stalewski, S. M., & Thomas, P. K. (January 2016). Freshman Transition Course Initiative in the College of Health Sciences, Connecting People and Practices, Student Success Strategies that Work. UWM Symposium on Teaching and Learning, Milwaukee, WI. Stalewski, S. M., & Barth, D. (February 2015). D2L Student Success System Pilot. UW Milwaukee Student Success Summit, Milwaukee, WI. Stalewski, S. M. (2011). Harnessing the Power of Social Media. President’s Summit: University of Wisconsin System, Madison, WI. Stalewski, S. M. (2010). ePortolios Across the Curriculum. Desire to Learn Fusion, Chicago, IL. Stalewski, S. M. (2010). ePortfolios in a Professional Program. Online User’s Symposium, Madison, WI. Stalewski, S. M. (2008). Podcasting 101 for CLS Educators. Clinical Laboratory Educator’s Conference, Savannah, GA.
Stalewski, S. M. (2008). Second life in eLearning. Educause Conference, Denver, CO.
Stalewski, S. M. (2008). Recruiting the Next Generation of Clinical Laboratory Scientists. Wisconsin Society for Clinical Laboratory Science, Pewaukee, WI. Alph Mu Tau Fraternity (2018, July 31) American Society for Clinical Laboratory Science. Board Service Award (2018, April 26) American Society for Clinical Laboratory Science – Wisconsin. Omicron Sigma (2018, April 26) American Society for Clinical Laboratory Science. Board Service Award (2017, April) American Society for Clinical Laboratory Science – Wisconsin. Omicron Sigma (2016, April) American Society for Clinical Laboratory Science. Proclamation for Body of Work (2016, April) West Allis-West Milwaukee Board of Education. Wisconsin Association of School Boards – level 4 development recognition (2015) Wisconsin Association of School Boards. Academic Staff Outstanding Performance Award (2011) University of Wisconsin-Milwaukee. Joanne Lazirko Award for Excellence in Teaching with Technology (2011) University of Wisconsin-Milwaukee. Member of the Year (2011) American Society for Clinical Laboratory Science-WI. Omicron Sigma Region award (2010) American Society for Clinical Laboratory Science. Omicron Sigma Region award (2009) American Society for Clinical Laboratory Science. Wisconsin Association of School Boards-Level 3 board development recognition (2009) Wisconsin Association of School Boards. Dean’s Award for Outstanding Service (2008) College of Health Sciences, University of Wisconsin-Milwaukee. Wisconsin Association of School Boards Level 2 board development recognition (2006) Wisconsin Association of School Boards.